Flame Lily Performing Arts share their enthusiasm for the culture and traditions of South Africa through lively dance and harmonious singing. Book them now for your event, wedding ceremony, conference or workshop. Flame Lily Performing Arts is a professional cultural performing arts company based in the United Kingdom. 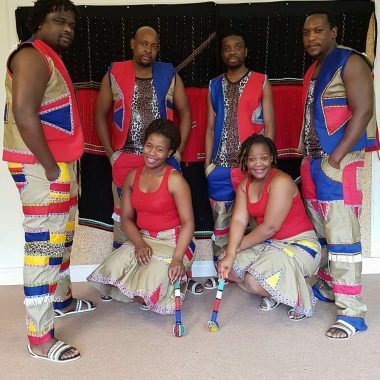 The group was formed in 2009 out of a shared passion for entertaining audiences around the world with the culture and traditions of southern Africa. We do this through lively dance and harmonious singing; delicately intertwining the traditional with the contemporary. All members of Flame Lily Performing Arts have been actively involved in arts and culture for the majority of their lives, and continue to do so with great passion and dedication. Flame Lily Performing Arts specialises in a variety of traditional southern African dances including Isitshikitsha, Ingquzu and Muchongoyo from the Ndebele culture; Mhande and Mbakumba from the Shona culture; Indlamu from the Zulu culture; and Setapa from the Tswana culture, amongst many other traditional dances from the region. Whilst we often back our dances with drumming and singing, and often incorporate the marimba, we also produce modern African choreographies that can be presented with commercial music. We perform Pantsula dance, and Gumboot dances from the goldmines of South Africa, which can be seen all over southern Africa. We sing traditional songs in Mbube-style harmony, with drumming, traditional shakers, marimba and mbira to accompany the music. 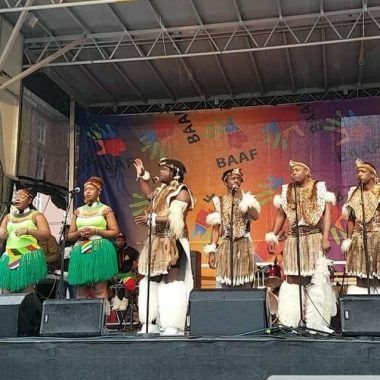 Our songs come primarily from Zimbabwe, South Africa and Botswana – and the languages we sing in include Ndebele, Shona, Xhosa, Zulu and Setswana. We offer workshops in southern African singing, dance, drumming and marimba to groups and classes of all sizes. Our workshops can be used in schools, community centres and theatres, or for private and corporate events. Participants get to experience southern African culture through its music and rhythms. Workshops can be booked for either half a day or a full day, or longer where required. Led by experienced workshop leaders, with live drumming, we lead students first through warm up exercises and then on to our traditional and contemporary African choreographies leading to a full group piece. Our school workshops are suitable for all ages, and can incorporate storytelling through movement. For diversity day and black history month engagements, we can produce specially themed works of typically 30 – 60 minutes long, or as required. These are very well suited to schools, community initiatives and cultural showcases. We offer colourful, energetic and exhilarating artistry with singing, dance, drumming, marimba and mbira. Engaging your senses through music and rhythm is a great vehicle for cross cultural dialogue and understanding. Our southern African music workshops are fun and lively. 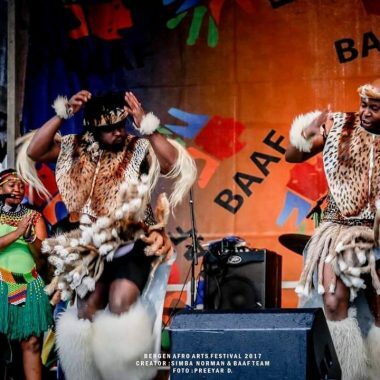 They give participants the opportunity to learn more about Africa and experience the culture and traditions of the continent first hand from southern African performing artists. Singing beautiful southern African folk songs is a wonderful way to bring any team or group closer together. 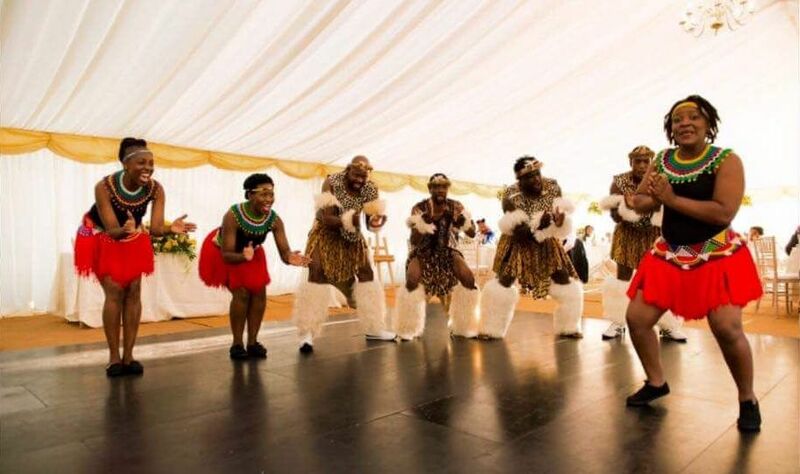 We teach traditional songs from Zimbabwe, South Africa and Botswana, and add simple dance movements and clapping patterns to really give a feel for southern African culture. Our songs are built up through harmonies, so everyone can find a voice that suits them best – and in so doing, we reinforce the importance of team work to produce a strong and beautiful sound.